vacuolation of the epithelial cytoplasm of renal convoluted tubules in people seriously depleted of potassium; vacuoles do not contain fat or glycogen, concentrating ability is impaired, polyuria and polydipsia are common, and pyelonephritis may develop. nephropathy with hypokalemia, interstitial nephritis, swelling and vacuolization of proximal renal tubules, and progressive renal failure, resulting from long-term conditions, such as oncotic overloading of the kidney filtration mechanisms by sugars. 1. pertaining to or characterized by hypokalemia. 2. an agent that lowers blood potassium levels. 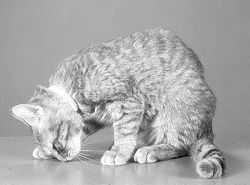 seen in cats with severe potassium depletion, usually caused by renal dysfunction and excessive urinary potassium losses. There is generalized muscle weakness, characterized by ventroflexion of the neck; other signs include weight loss, chronic vomiting and constipation. chronic loss of potassium due to alimentary tract disease can cause vacuolar degeneration of renal tubular epithelium.